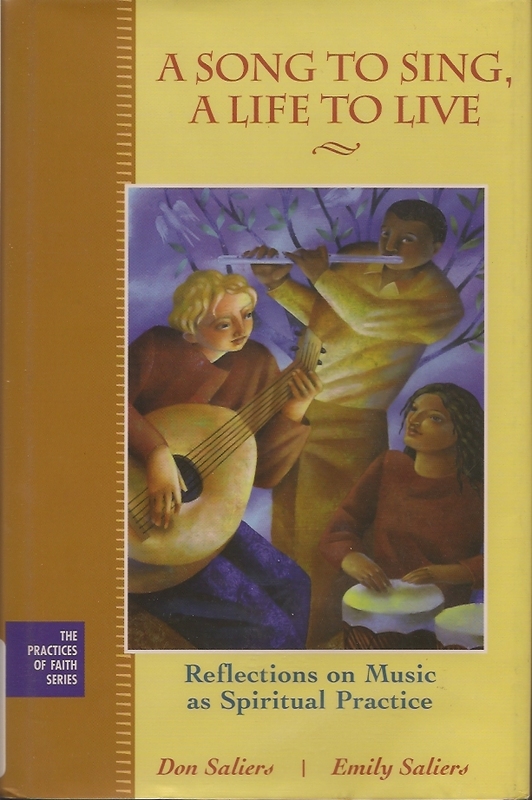 A Song to Sing, A Life to Live: Reflections on Music as Spiritual Practice by Don Saliers and Emily Saliers (2005) San Francisco, CA: Jossey-Bass. 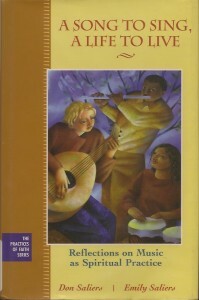 An inspiring book about music and its ability to stir our souls. Beginning with their own stories as musicians (Emily as half of the folk-duo the Indigo Girls, Don as a well known church musician and theologian), the father-daughter Saliers explore music as a spiritual practice. Their discussion/conversation includes: the bodily and sensory experience of music, music across the lifespan, how music can bring us together as well as divide us, how music shapes our identity, music’s role in grieving, and music’s role in work for social justice. The spiritual aspect of music is woven throughout these topics; different perspectives on spirituality are included. I truly enjoyed this book. It reminded me why I still consider myself a musician (though I rarely play anymore). I’m inspired to rediscover my own “songline,” the story of who I am as revealed through the music I love. My only criticism is that sometimes the flow of the writing is uneven, but that is to be expected when two rather different perspectives and voices try to join together. Each individual voice is strong, but together their differences sometimes impinge on the harmony. Still, all in all, the underlying message of the song comes through. Disgusted with poor umpiring, the stretched out playoff schedule (which I can only assume was designed by the TV networks), and rather sloppy play, I skipped baseball last night and watched a different LA event: Great Performances broadcast of Gustavo Dudamel’s Inaugural Gala and Opening Night Concert with the Los Angeles Philharmonic. I’m not a big fan of anything in Los Angeles, but MPR has been plugging this concert quite a bit, so I thought I would see what all the excitement was about. The concert included two pieces: John Adams’ “City Noir” (commissioned for the event) and Mahler’s Symphony No. 1 in D Major. Both provided the “Hello, LA. Here I am. Let’s have some fun.” message that I think Dudamel was going for. I enjoyed “City Noir” more than I expected, especially the saxophone solos throughout, the wide variety of percussion instruments included, the use of piano, celesta, and 2 (!) harps, and the blending of Latin and film noir influences. While the opening movement “The City and Its Double” was a bit chaotic, the second movement “The Song is for You” was lovely, and the third “Boulevard Night” brought everything to an exciting conclusion. For a more authoritative review of the concert, see the LA Times Review. And catch the replay of Great Performances if you get a chance. Been away for awhile. Lots to report, but probably won’t try to do it all at once. This past weekend was a busy one. Nephew Sean was in town on Wheaton Academy’s “Instrumental Tour 2008: Phil. 2:3-4”. Went to hear them play at Bethel University on Friday and at the Salvation Army on Saturday morning. The highlight was the Percussion Ensemble, especially their “Jam” with the clients at the Salvation Army. WOW–very powerful and moving. On Sunday poet Mary Oliver read at the State Theater. Lovely. And I got to see three of my favorite writers on the same stage (thought not at the same time): Elizabeth Jarrett Andrew had the honor of introducing Mary, and Mary Rose O’Reilley moderated the question and answer period. To top off the weekend, Monday brought the Home Opener for both the Chicago Cubs and the Minnesota Twins. At 10 am the Cubs held a ceremony to unveil the new statue of Ernie Banks. Even the rain and a cold couldn’t keep Ernie under the weather. Unfortunately, the rain did delay the game by about an hour, but just before 2 pm, Wayne Messmer sang The National Anthem and things got underway. A pitchers’ duel through 8 innings, the game broke open in the ninth with each team scoring three runs. Our new outfielder Hosuke Fukudome was the star of the day. Unfortunately, the Brewer’s came back in the 10th and the game ended with the Cubs losing 4-3. But “it’s a long season and you gotta trust it” as they say in the movies. Due to a mid-Cubs-game rain delay, there was just enough time to change channels and catch the start of the Twins Home Opener at 6 pm. Thanks to him, the Twins won over the Angels 3-2. Unfortunately, last night’s Twins game was too painful to watch. The Angels won 9-1, hammering Boof Bonser pretty hard. On the food front, more recipes soon; I was on a rice kick for a while and have several of my favorites to add. Of course, Opening Day is all hot dogs and brats and root/beer. Enough for now. Enjoy the season.